Spinning is the art of casting and retrieving a lure designed to look or act like a small fish, frog or mouse. Spinning is often a deadly method and most sea, game or coarse anglers find it necessary to spin at times. Using a variety of spinner-spoons and plugs, anglers use it for a number of different species on waters throughout the country. Spinning is also one of the best methods of fishing for young anglers to use. Armed with one or two plugs, a closed-face fixed-spool reel and a decent spinning rod, the novice will learn both to cast and to catch a sizeable fish. Most game fish take a spinner readily. Many sea fish, even flounders, fall to them, and in coarse fishing, pike, perch and chub take these lures often, while other fish in the carp family (bream, carp, tench, and others), and zander will also take them occasionally. Generally speaking, spinning is a good method for the open river where there are deep pools, or for large stillwaters, gravel pits and reservoirs. One should not spin, if unskilled, in confined spaces, as retrieval will be difficult. If the river is overhung with much vegetation though it may hold good fish, bad casting will result in lost lures. Choice of rod depends on the water more than anything else. On big rivers, gravel pits or reservoirs you may need a powerful, two-handed, stepped-up carp rod to throw biggish spoons, spinners or plugs a long way. In contrast, on small rivers, canals or ponds, short casts with a 7-8ft spinning rod of hollow glass for use with lines of 5-8 lb b.s. May be adequate. A certain amount of common sense is needed in choice of rod: big 370 closed-face reels are rarely used. For playing heavy fish they prove to be ineffective since the line within the housing goes through too many angles, creating considerable friction. Many open-faced fixed-spool reels are, however, superb. One with a roller pick-up and a reliable, easily reached anti-reverse switch is especially useful. The species of fish also governs the choice of rod, reel and line. In weedy water, like the Fenland drains, you need heavy line and a powerful rod to hold the fish. The same applies to heavy fish in small waters. On the other hand, when perch or chub fishing, a MK IV carp rod, or its lighter version, the Avon, in glass or split cane, are excellent. Ultra light spinning is proving to be increasingly popular. For this, a sawn-off length of fly rod, 5-6ft, with a line of 4lb b.s. Is recommended. A tiny fixed-spool reel of high quality, like one of the small Shakespeares, Daiwas, or Ryobis, and small lures, almost down to big flies in size, but with diving vanes or propellors, are also necessary. You can, in fact, make your own lures on big single hooks, and catch more carp species with this than you would on conventional spinning gear. The wide range of rods and reels provides great versatility of spinning techniques. Lines are also varied, but a good standard line is a simple monofil, usually dyed dark in colour, and supple. Some anglers use plaited nylon, particularly on multiplying reels, but monofil generally has more stretch. Other spinning, such as trolling from a boat, may require special lead-cored lines, and some sea spinning is done with wire lines. Different strengths of nylon monofil together with appropriate weights to get the spinner down, usually prove adequate. If a fish has sharp teeth you may need a wire trace on the line. This applies particularly to pike and zander and many sea fish, but not when spinning for game fish, or coarse fish such as perch or chub. Cabled, supple, dark coloured wire is better than made up, plastic coated, shiny traces. Add a swivel to one end and a safety-pin link swivel to the other by passing 2in of cable wire through the swivel eye. Laying it back parallel, twist the two parts together by hand. Crimp-on sleeves can be used to secure the join, or strong glue, but in fact these are not usually needed. At the waterside, remember that you are always on the move, so a minimum of equipment is advisable. A small rucksack on your back is best, to hold food and waterproof clothing, and an angler’s waistcoat with numerous pockets for spinners, spoons and miscellaneous items of tackle such as a spring balance, forceps for removing lures from fishes’ jaws, a sharpening stone for blunted hooks, scissors and other small items, will prove useful. For landing salmon a small, collapsible net, gaff or tailer is necessary. Always take enough clothes to keep warm. If possible wear plimsols or walking boots rather than Wellingtons or waders, although weight and heat saving on footwear is not always a good thing. Clothes should be drab, and the approach to the waterside quiet. It is a good plan to fish through the spot you intend standing at, particularly on a coarse fish water where another angler’s groundbait may have attracted shoal fish and predators close in to the bank. Where to cast? First, with a sinking spinner, find out the depth of water working on the principle of retrieving slow and deep. Cast out and allow the spinner or spoon to sink with the pick-up off, and judge the time it takes the spinner to strike the bottom. As the spinner nears the bank, raise the rod top to avoid the lure running into the slope. Casting in a fan-wise fashion, each cast being some five degrees to the side of the previous cast, is also used, but this can make for boring fishing, except from an anchored boat. It is probably better to cast where you think the predator will be. Having explored the most likely places – ledges, sunken branches, and holes behind boulders – move on and try another spot. Some anglers have difficulty estimating how far out the lure is. To remedy this, tie a nylon stop knot, such as a Billy Lane stop knot, to the line at a fixed length above the lure, perhaps 15ft. As the knot clicks through the top ring you will know where the spinner is. This is particularly useful for night spinning – one of the most exciting forms of fishing there is. For night spinning you also need a shot clipped on the line just above the trace swivel, or if not using a trace, some 2ft up the line. This prevents the trace swivel being reeled into the end ring of the rod, or the spinner itself being retrieved too close to the rod tip. It should usually hang a couple of feet from the rod tip prior to a cast. Another important consideration when spinning at night is to know how far you have cast. Fortunately this is fairly easy. In daylight measure out a suitable-length cast by pulling line off the reel, then secure a rubber band round the spool before reeling the line back on to the reel. This avoids overcasting. Spinners, spoons and plugs come in all colours and sizes. Simple spoons are egg-shaped and can be made from dessert spoons. Despite their simplicity they will take almost anything that swims. Drill a hole out at each end and by using a split ring, add a treble hook at one end and a swivel at the other. Elongated, concave-convex spoons, with or without fins, are also useful. Bar spoons are attached at one end to a bar forming an axis around which the blade spins. The tiny sizes will take trout, sea trout and perch, and the large sizes pike and salmon. They retrieve with greater vibration, but, unlike many spoons, retrieve in a more or less straight line unless the angler alters the position of the rod end. Fly spoons are a kind of small bar spoon, while many other spinners, like some minnows, and mackerel spinners, have a hole through them and rotate about their whole length. Plugs can be floaters (poppers or crawlers), floaters which dive to depths, or sinking plugs. These are available in one piece, or with two or more pieces. Some plugs dive shallow, some deep. Perhaps the most versatile, all-purpose plug is the smallest. Around an inch in length, with wood, fur and feather attached, it is almost as good as the fly-type lures. This type of plug can be fished on fly rods or with ultra-light gear. 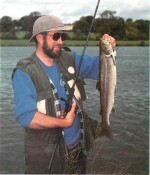 The action of the spinner in the water is essential to a successful catch. For most species this should be slow and steady; for trout, fast and steady. Occasionally aim to retrieve in short bursts, swinging the rod from side to side. This will vary the direction and add a lifelike flutter to your spinner. When retrieving try not to be too quick, as the lure will rise high in the water; on the other hand, one should not retrieve too cautiously for fear of snagging your lure. Plugs and spinners can easily be made at home, adding in many ways to one of the most enjoyable aspects of fishing.